Hsing means shape or form, Yi means will or idea. 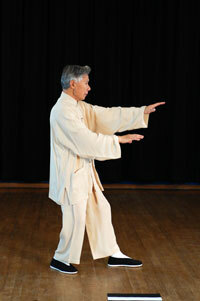 Hsing Yi was the first martial art to recognize and emphasize the importance of the mind-body relationship. By simplifying movements into straight and circular motions, the Hsing Yi artists departed from the traditional stance of distributing weight evenly on two legs. Rather, they carried weight on one leg with the other leg free to move to attack, defend, or avoid attack. According to the Yin Yang principles of negative and positive, the weight bearing leg is positive, the free leg negative. As with Yin Yang, however, the two are related and ever changing, so that yin is within yang, yang within yin. This describes the Hsing Yi stance. There are five basic forms in Hsing Yi named after the five elements: metal, water, wood, fire and earth, which correspond to five major organs of the body. Metal gives birth to water, water to wood, wood to fire, fire to earth and earth to metal, in what is called the birthing circle. Metal controls wood, wood controls earth, earth controls water, water controls fire and fire controls metal, in the controlling circle. 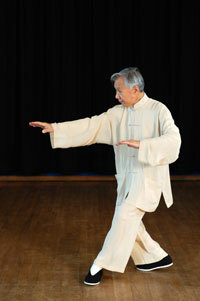 The practice of Hsing Yi is guided by these principles. Although its forms are relatively simple to the eye, to gain strength and acquire skill through practicing Hsing Yi, a student must be serious and diligent. Hsing Yi is the oldest of the three arts, with roots dating back to the 13th century during the Sung Dynasty. Sun Lutang (1861-1932) was its most famous contemporary teacher and author of a classic work on Hsing Yi. While not a relative, Sun Sikung (1883-1952) was a master in his own time and taught in Hong Kong during the early 1950s.